Discover the best social media marketing techniques from a senior social media consultant. Do it yourself work on social media for your Digital Marketing strategy! WHEN? Saturday, 20 January 2018. 8:30 am to 1:30 pm. WHERE? Conference Hall, MCCIA, Senapati Bapat Road, Pune. OR Whatsapp your name, company name to Jyotindra Zaveri 9552946949. I will text you bank details. Hands on training: Bring your Smartphone / Tab (or laptop with Internet dongle). Join 20 entrepreneurs, marketers, and professionals at this MEETUP, designed to empower you with business-building ideas - brought to you by Jyotindra Zaveri. • Are you new to social marketing? If you are new to social media marketing, just know that the industry is in constant flux. This means even the most experienced marketer is often restarting the adventure, over and over. You have an opportunity to embrace the latest techniques at this workshop. Therefore, while this event is ideal for the experienced social marketer, even a beginner will find value. 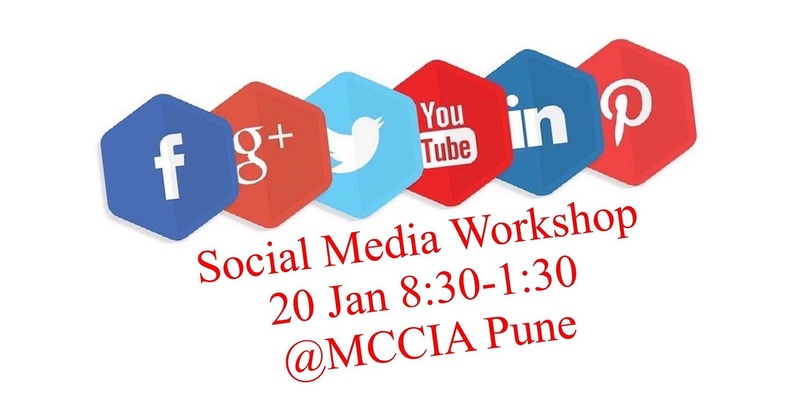 • The social media marketing professional: If your job is to manage social media marketing, but you are struggling to keep up with the ever-changing nature of social marketing, this event is for you. • Discover advanced digital marketing ideas to accelerate your growth: Social Media Marketing workshop by Jyotindra Zaveri is where you will find the best insider secrets, the latest developments, tools that will help you grow your business, and at the end, you will feel confident to plan your social media marketing. • Extensive networking opportunities - you will make priceless professional connections. This is a great opportunity to connect, share ideas, brainstorm, and amplify your social marketing with your peers, marketing professionals, and experts. For For hands-on experience bring your net-enabled Smartphone or Tab or Laptop with Internet Dongle. Special consideration for all past participants. Whatsapp Jyotindra Zaveri for details.